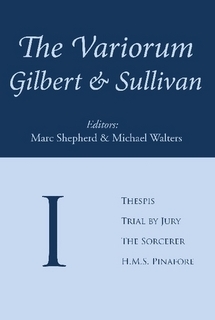 We are pleased to announce publication of The Variorum Gilbert & Sullivan, Volume I, the essential textual reference to the first four operas by W. S. Gilbert and Arthur Sullivan: Thespis, Trial by Jury, The Sorcerer, and H.M.S. Pinafore. So…what's a Variorum? The term, Latin for of various people, refers to an edition that presents the variant states of a text, with editorial commentary. 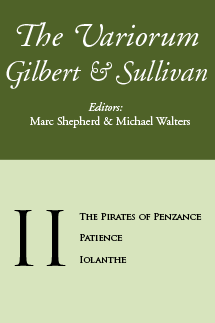 This is the first of a five-volume variorum of the Gilbert & Sullivan libretti, documenting their evolution from pre-production drafts and the early productions, through revivals, twentieth-century D'Oyly Carte amendments, and the contributions of later editors and editions. The book is 781 pages, of which the first 169 are a general introduction that discusses the partners' working methods, a survey of the sources and the textual problems they present, and the editorial process. Each opera also has a separate detailed introduction that discusses its textual history, sources, and issues. These introductions are substantial resources in and of themselves: that of Pinafore runs to over 100 pages. Also included are deleted passages (cancelled lyrics and songs) and supplemental material, such as "An Elixir of Love," the short story that inspired The Sorcerer, presented with the original Gilbert drawings as it appeared in Christmas 1876 issue The Graphic, with variants noted from its re-publication in Gilbert's 1890 compilation of short stories, Foggerty's Fairy and Other Tales. There are, of course, many collected anthologies of Gilbert's libretti. Most offer the texts with no analysis at all, or with mainly non-textual commentary (e.g., production practice; definitions of obscure words and phrases). Reginald Allen edited what he took to be the first-night libretti in The First Night Gilbert and Sullivan; Ian Bradley quoted many of the pre-production drafts and variant readings in The Complete Annotated Gilbert and Sullivan. But neither explored the full textual history of Gilbert's libretti systematically. We present, for each libretto, the text that we believe Gilbert and Sullivan would have settled upon, had they taken the time to resolve all of the discrepancies amongst the various sources. That they did not do so themselves may seem surprising, but they were practical men of the theatre: their aim was to produce the operas for immediate critical and popular success, not to establish texts for later generations. They never reconciled the many disagreements between the published libretti, vocal scores, and the texts as actually performed at the Savoy. Textual criticism isn't an exact science: other editors would reach different conclusions. 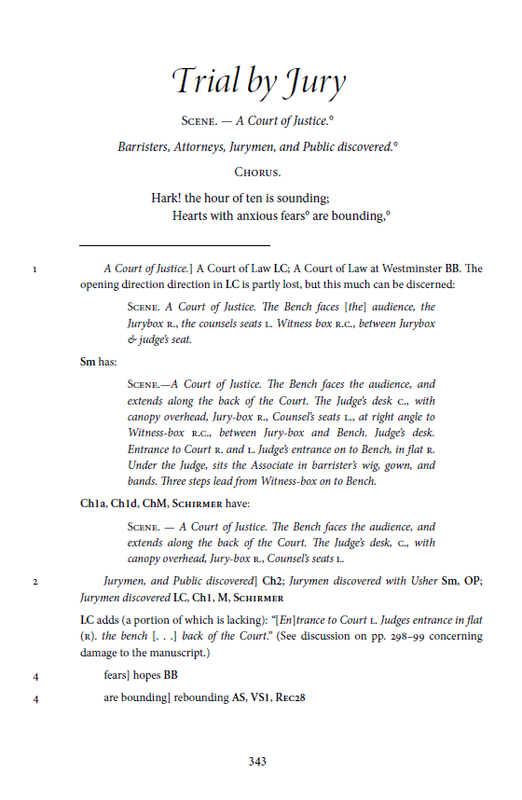 But as this is a variorum, variant readings that have any reasonable claim to authority share the page with the libretto text, so that readers can judge for themselves the basis of our decisions. We also consider all of the surviving drafts, discarded versions, and other historically important sources—even if the latter did not have the authors' approval or willfully contravened it. Those who have wondered about the provenance of a variant passage will now have its textual history. Beyond the value of establishing a text, a variorum serves other purposes. 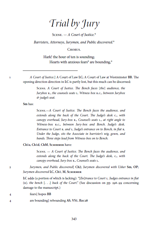 Performers may choose to restore material that the authors had rewritten or cut. Alternative readings shed light on the history of a work's creation and reception. From the evolution of the texts, we learn more about the thought processes of the men who created them and the cultural climate in which they worked. Even their rejects make compelling reading. Their discarded drafts are the residue of a creative process that was often more complex, and less linear, than would be apparent from the familiar biographies. At one time, we thought we could accomplish all of this, for the whole canon, in one book. We now find that we have enough material for five volumes. The second volume (with Pirates, Patience, and Iolanthe) will follow eventually, and so on to the end. Some readers may be aware that we have been working on this for a long time: 35 years, believe it or not: there's decades of work invested in this first volume of four operas. The Variorum Gilbert & Sullivan, Volume I, is published in hardcover with a dust jacket, and is available from Lulu.com for $40 plus shipping.